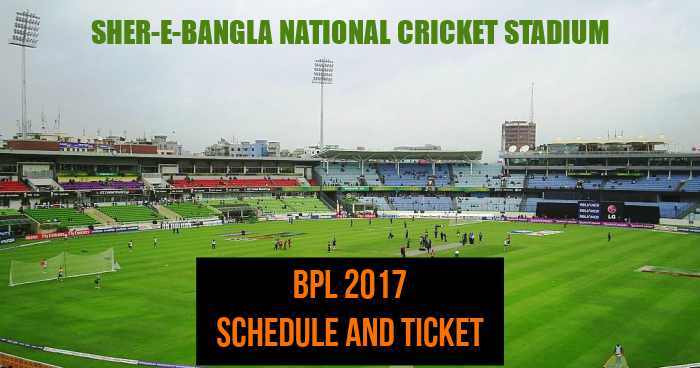 Sher-e-Bangla National Cricket Stadium, Mirpur in Dhaka will host the Bangla Premier League (BPL) 2017. Sher-e-Bangla host most of the matches of BPL; and in BPL 2017 it will be hosting a total of 28 matches including play-off matches (Eliminator, Qualifier 1 and Qualifier 2) and Final. Sher-e-Bangla is the home ground of Dhaka Dynamites and is used as the home ground by Comilla Victorians, Khulna Titans, Rangpur Riders and Rajshahi Kings in BPL 2017. The timing for tickets purchasing is from 10:00 to 18:00 on non-match days and on non-match day ticket sales will be dependent on availability. The first match at Sher-e-Bangla will be played on 11th November 2017 between Rangpur Riders and Rajshahi Kings. And the final will be played here on 12th December 2017.